At least once a year, we spend the weekend in San Diego and visit our favorite parks, restaurants, and museums. October is usually the best time to visit since during the entire month, kids eat, stay, and play for free throughout San Diego. This year, we were so excited to return that we opted for September instead. While San Diego is our favorite city in the world, we hate trying to find parking and maneuvering in the city can be difficult. 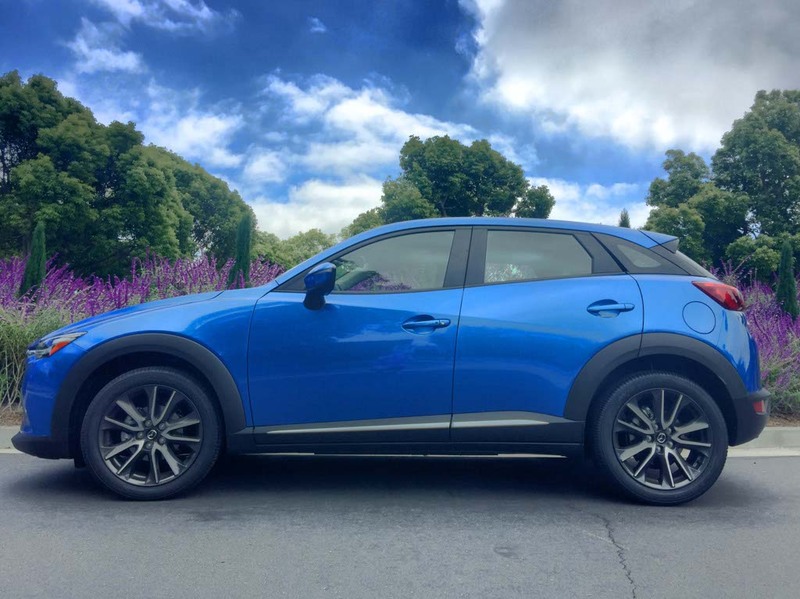 Rather than driving down in my van, I took a Mazda CX-3 for a test drive thanks to DriveShop. It’s compact, great on gas, comfortable, stylish, and the bright blue color was easy to spot in crowded lots. For zipping around in the city, the Mazda CX-3 was the perfect fit. During the drive to San Diego, we had to take the I-5 freeway. Even in the commuter lane, traffic can be a nightmare. There is stop-and-go traffic and commuting that swings from 65 mph to a standstill. The awesome part about driving in the Mazda CX-3 is that it has adaptive cruise control (ACC). It’s an intelligent form of cruise control that slows down and speeds up automatically to keep pace with the car in front of you. The driver sets the maximum speed — just as with cruise control — then a radar sensor watches for traffic ahead, locks on to the car in a lane, and instructs the car to stay 2, 3, or 4 seconds behind the person car ahead of it (the driver sets the follow distance, within reason). Using ACC totally changed the drive and eliminated tons of stress. I had never used it before, but it was easy to set and it made it so much smoother than hitting the brakes every few seconds to adjust for stop and go traffic. Mazda’s slogan is “zoom zoom,” so it’s no surprise that the CX-3 handles well. It goes from 0-60 mph in around 8 seconds, which is slow for a sporty car, but not bad for a subcompact crossover SUV. We weren’t looking to do any street racing, but it was nice to have a little pick up with minimal engine noise. Once we arrived, we went for lunch in the city. Small spaces weren’t a problem and I parked perfectly between the lines on the first try. Anyone from San Diego or California in general knows how tiny spaces can be and pulling into a spot can be a struggle. I don’t know how people driving large trucks or SUVs do it. They must spend a small fortune in valet to avoid the struggle. 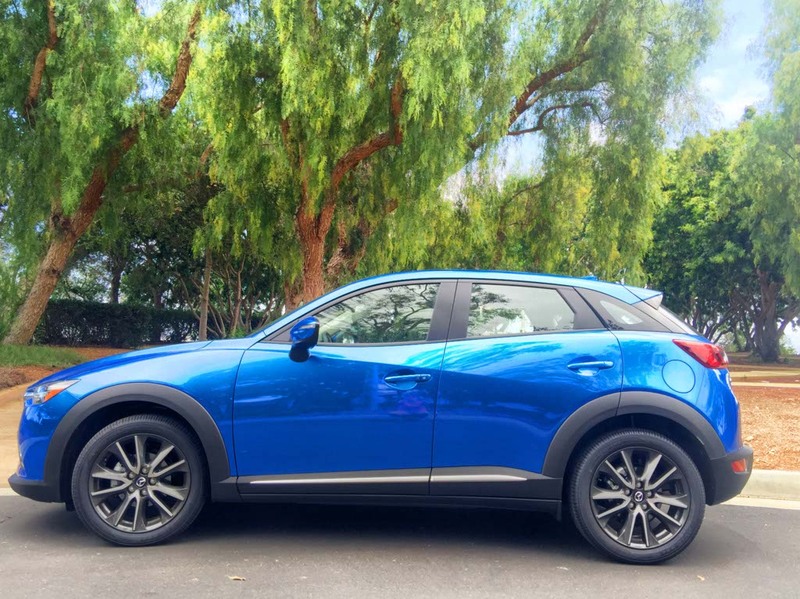 One of my favorite things about the Mazda CX-3 was the bright blue color. Blue is my favorite color anyway but it was unique and easy to spot in packed parking lots. 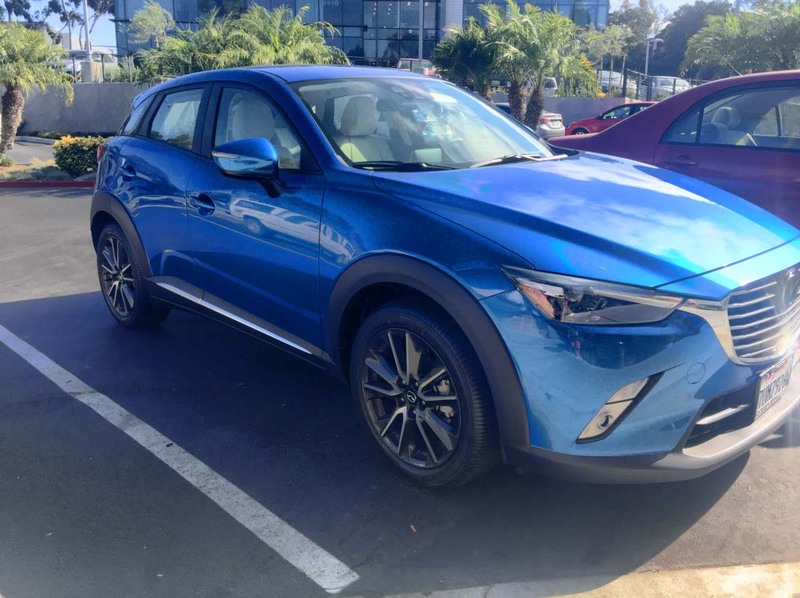 When we parked at SeaWorld, the CX-3 was among hundreds of other cars in the lot. I did take note of the section but I immediately spotted it from the gate when we were leaving. If you’ve never had a unique, bright color car before, give it a try. You’ll be surprised how much of a difference it makes and how much easier it is to spot your car. 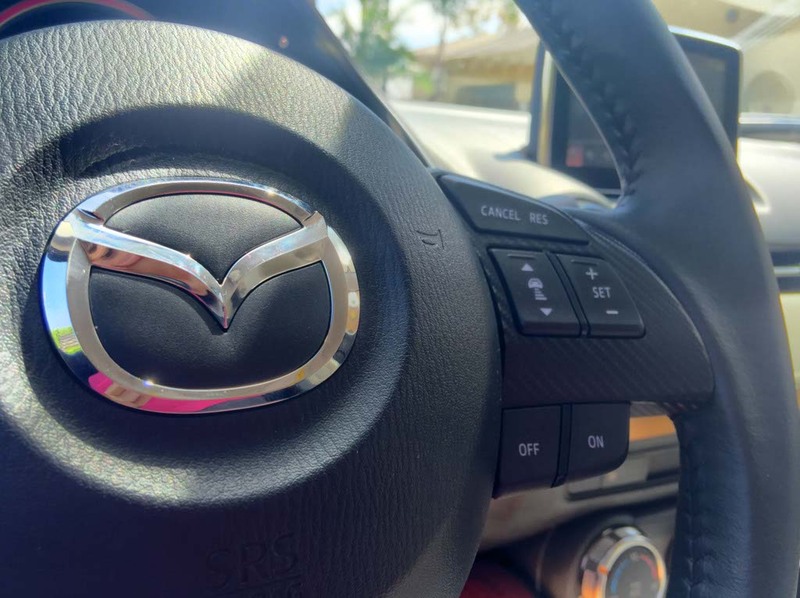 Every CX-3 has front-wheel drive, and includes remote keyless entry, push button start, a rear camera, and the Mazda Connect infotainment system. 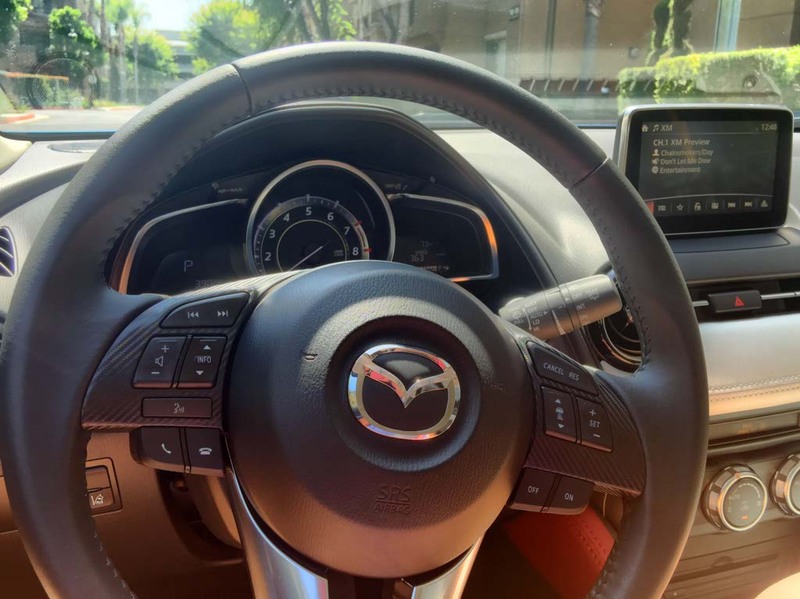 The rear camera is a game changer in the city and I like having the navigation system, but the Mazda Connect is not the most intuitive system. Give yourself some time to master the controls. Even the most basic functions require lots of taps, twists, and icon deciphering. You can use the 7-inch touch screen or the iDrive-like control wheel and function buttons on the console. Navigation gets the job done, but it’s slow to respond. There is so much that I love about the Mazda CX-3 but they have a little way to go with the Mazda Connect. The Mazda CX-3 handles well, gets get fuel economy, and offers a wide selection of driver assist features. For one or two adults in the front seat, it’s a great choice. My only real concern is that the amount of space behind the front seats is seriously compressed. We fit comfortably but I could see outgrowing the car as a family. If you’re looking for a compact car that does great in traffic and fits in almost any space, this is the one for you.